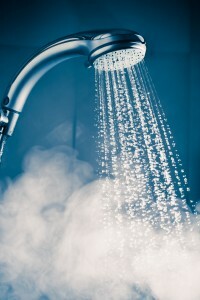 A water softener system has multiple benefits for the showers in your home, as well as for those who use them. Showers and bathtubs can start to look dingy over time, and accumulate buildup that can require scrubbing with harsh chemicals to remove. Some are surprised to learn that it is actually not dirt, but the hard water coming out of the faucet, that can cause showers and bathtubs to suffer from a buildup of residue. Additionally, this buildup can occur on your shower head, causing it to clog over time. The reason a water softener system can prevent this buildup is because it will remove the “hard water” minerals — calcium and magnesium — in your water that causes the buildup. Soft water will make it so that your shower surfaces remain free of water deposits and your shower head remains free of clogs. An unclogged shower head will help your shower’s water pressure remain at full strength, so you can shower more quickly and save water and energy. Soft water leaves skin feeling smooth and soft. Hard water, on the other hand, can leave skin feeling dry, tight, and flaky. Hair that is washed in soft water looks shinier. Hard water minerals such as calcium and magnesium can be damaging to hair. A water softener will make your soap and shampoo produce more lather and rinse more cleanly. Not only will this help you cut down on the amount of products you use, but you also may only need to do one round with shampoo and body wash instead of two. This is easier on your hair and skin, and also allows you to spend less time showering and less money on products. To learn more about the many advantages of having a water softener system installed in your home, and about RainSoft’s full line of water treatment options, contact your local authorized RainSoft dealer to arrange a complimentary in-home water analysis.